Vitamin C -- A key factor in the immune system, including white blood cell function and interferon levels. It combats the effects of frree radicals and promotes growth and tissue repair. Zinc -- A component of over 1200 enzymes that work with the red blood cells to move carbon dioxide from the tissues to the lungs. It promotes normal growth and aids in wound healing, cell division and maintains normal levels of Vitamin A. Blue Green Algae, Brewer’s Yeast, Cat’s Claw, Evening Primrose Oil, Shark Cartilage, Oyster Shell, Alpha Amylase, Beta Carotene, Pine Bark, Papain, L Methionine, Alfalfa, Chicken Liver, Vitamin B1 (Thiamin), Vitamin B2 (Riboflavin), Vitamin B3 (Niacin), Vitamin B5 (Pantothenic Acid), Vitamin B6 (Pyridoxine), Vitamin B12, Vitamin D, Vitamin K, Manganese, Magnesium, Iron, Copper, Amino Acids (Tryptophan, Threonine, Isoluecine, Luecine, Lysine, Methionine, Cystine, Phenenylalaine, Tyrosine, Valine, Arginine, Histidine, Alanine, Aspartic Acid, Glutamic Acid, Glycine). 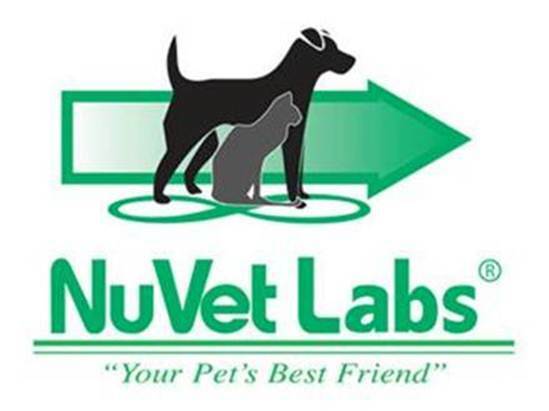 Why Do We Recommend NuVet? Over the years, we have tried so many different brands of vitamins and nothing has even come close to the quality of NuVet. The NuVet Plus Powder is 100% made with real chicken liver so that even your most finicky, picky dogs or puppies will love it. It can be used on wet or dry food. Designed for ALL breeds, sizes and ages of dogs, from puppies up to seniors. It gives your pet a stronger immune system, strengthens their heart, lungs, liver, kidneys, nervous system, muscle development and connective tissues. 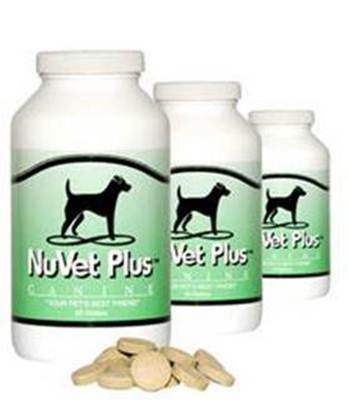 NuVet Plus Powder is full of the proper vitamins, minerals and a complete antioxidant intake. It’s balanced to improve metabolism of proteins, fats and carbohydrates, increases energy, joints and motility and gives your dog or puppy that extra resistance to diseases as well as aids in preventing your pet from getting various, serious, long-term health problems, especially at an early age and much more!! 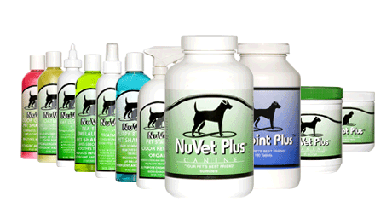 So with their products, your pet has nothing to lose and everything to gain. We strongly believe in providing our Bulldogges and their babies with everything they need to have the best start to help them live long, healthy and happy lives! Why Give Your Pet Daily Vitamins? Remember, Optimal Health comes from a Lifestyle - NOT a quick fix! Do you want to improve your chances of LESS overall medical bills & heartbreak throughout your pets life due to various health problems? Do you want to strengthen your pets immune system & vital organs? Do you want to prolong your pets life? If Yes, then it is critical that your pet receives a high quality diet, exercise, positive socialization, proper shelter & an optimal daily vitamin since dog & puppy foods alone (high or low quality) just don’t cut it. Don’t wait until your pet is older & already starting into health problems before you get serious about doing anything. By that time, a lot of irreversible damage can be done to the main organs from all the years of lack of proper living, diet & nutrition. If your pet is already older & having health issues – these vitamins have really made a difference in improving a lot of health conditions when used (in addition to) your veterinarians treatment plan. If your pet is healthy – these vitamins are an excellent “preventative” to help KEEP your pet from showing health issues at an early age. Consistency is the key to healthy living in anyone ~ including pets. So whether you invest in NuVet or another supplement – we hope you make giving your pet a high quality vitamin or supplement daily.